Migraine is one of the most common and debilitating neurological conditions known in the healthcare world. The pain of a migraine headache is an intense throbbing or pulsating pain that commonly presents itself in one area of the head. An attack can last anywhere from 4 hours to 3 days and additional symptoms including nausea, vomiting, increased sensitivity to light, sound, and smell, and vision changes are likely to occur. People who suffer from migraines tend to have recurring episodes that may be triggered by several different factors. Potential triggers that have been identified include hormonal changes, changes in sleep patterns, stress, alcohol, certain foods and food additives, bright or flickering lights, and environmental factors such as weather changes. For every million people in the general population, 3,000 will experience a migraine each day. These statistics also illuminate the important point that although migraines definitely affect women far more frequently, men and children also pay the price. What is the impact of migraines on daily life? Migraines can be a debilitating condition to live with, making it difficult or even impossible to maintain a regular school or work schedule. What is the financial burden of migraine? The financial costs of caring for migraines can also become a burden. 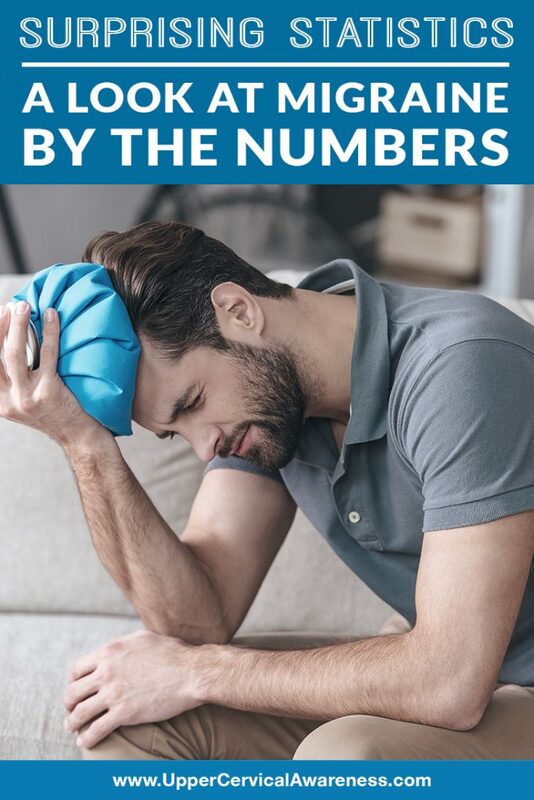 Not only are healthcare costs a factor, but as mentioned above, many migraine sufferers are unable to work due to their condition which only adds to the financial impact. What are common symptoms migraine sufferers experience? Traditional methods of migraine care revolve around medications that are either used to try and prevent future attacks or to try to reduce the pain and other symptoms of an attack that is already in progress. These combinations of medications yield varying results and come along with the risk of potentially unwanted and dangerous side-effects. More importantly, while medications can surely provide relief, they do not address the underlying cause of the problem. Many migraine sufferers are turning to upper cervical chiropractic care as a way to address the underlying cause of their condition and get lasting relief naturally. The more research that is done around what causes migraines, the more that it’s understood that there are complex neurological mechanisms involved within the central nervous system, or CNS. The reason upper cervical care is so effective in helping migraine sufferers to get well is that it addresses one of the most common areas of neurological obstruction within the CNS. The upper cervical spine, consisting of the atlas (C1) and axis (C2) vertebrae, protects the brainstem as it exits from the base of the skull and transitions into the spinal cord below. Not only is this area neurologically rich, it also serves to ensure normal blood flow and cerebrospinal fluid between the head and neck. When there is a misalignment of the vertebrae that protect the brainstem, it can begin to hinder normal neurological function and set the foundation for migraines to develop. Although these misalignments may be subtle, their impact can be severe. Upper cervical chiropractic care takes a very methodical and precise approach to analyze and correct these misalignments. Unlike a general, one size fits all approach, upper cervical chiropractors take into account the unique needs and history of each patient. Based on a thorough analysis, an adjustment will be customized for you in order to obtain the longest-lasting results using as few adjustments as possible. Living with migraines can feel hopeless at times, but a consultation with an upper cervical chiropractor may give you back the hope and quality of life you’ve been missing. To locate an office in your area, use the search feature on our website to get started on the road to feeling and functioning better.